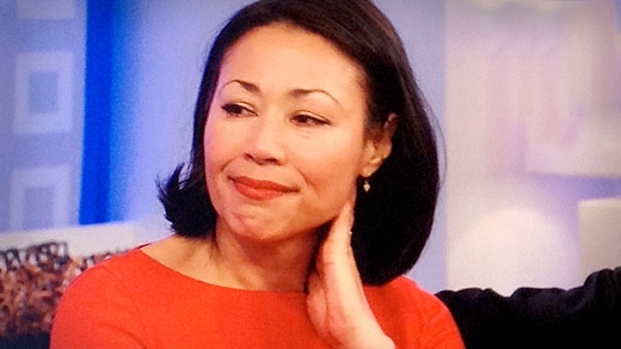 Ann Curry officially stepped into her new role as co-host of "Today" alongside Matt Lauer. "I'm Ann Curry, and I'm in for...I guess, nobody." With that, the 14 year "Today" veteran began her new role as co-host alongside Matt Lauer. "I feel like Cinderella," she joked, squeezing Lauer's hand. "It's going to be fun." After yesterday's grand and tearful good-bye to Meredith Vieira, the "Today" show officially shifted gears with Curry replacing Vieira and Natalie Morales stepping behind Curry's former news desk full time. Curry was welcomed with more than just self-deprecating humor, however. Former First Lady Laura Bush recorded a special video greeting, congratulating Curry on her new role. But it was a second video - this one from Curry's husband and daughter offering their love and support- that finally broke Curry down. As she wiped tears from her eyes, Lauer enthused, "This is an exciting new chapter in the history of the show, but this is a comfortable fit." Lauer then introduced a video montage of Curry's best NBC moments - ranging from hard-hitting news reports, free-wheeling comedy segments, and the occasional endearingly awkward behind the scenes flub. Jokes, tributes, and a few tears and the Curry era of "Today" officially begins.